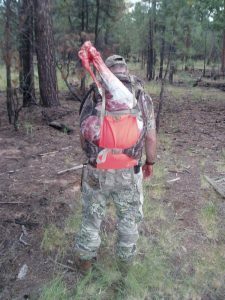 Badlands 2200 Review - The Best Hunting Pack Ever? Badlands has spent the past twenty years developing the best gear for modern hunters. From packs to clothes, shelters, and sleeping bags, this company’s got a little of everything for outdoor enthusiasts. They’ve got an incredible lifetime warranty too. They don’t care what happened, they’ll fix it for free, forever. It doesn’t matter where you got their pack either. Today, we’re going to look at Badlands 2200 hunting backpack. We’ll review the pack, break down some of it’s key aspects, and list out the pros and cons so you can figure out if this is the right investment for you. While this pack was designed for the day or overnight hunter, the Badlands 2200 pack also works well as a pack for anyone who works in the field like trail maintainers and geologists. If you’re a conservative backpacker, you might also find this pack is suited your rugged adventure. This pack is made from KXO-32 fabric which is praised by Badlands as being “the strongest, quietest, most waterproof material in the hunting world” and it comes in two patterns: Approach Camo and Realtree AP-Xtra. 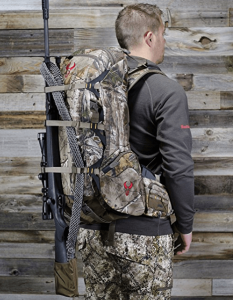 The Badlands 2200 hunting pack measures 19”x17”x19”, weighs 5lbs and 15oz, and has a volume total of 22.5L or 6G. When it comes to hydration, this pack gives you room for a 2L (0.5G) reservoir. Word to the wise, Badlands backpacks only fit Badlands water bladders, which have more of a rectangular shape. The frame of this pack is made from T-6 aircraft aluminum and features molded foam suspension. Both of these features work together to keep the pack light and comfortable. Don’t forget, this pack has a lifetime, unconditional guarantee. 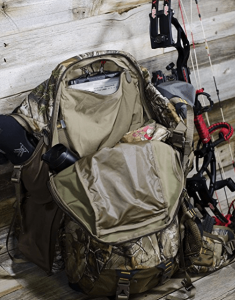 The Badlands 2200 hunting pack has two main compartments. The biggest compartment is meant to carry the bulk of your items and the second compartment is located on the front of the pack. It’s more shallow and is meant for fast access to smaller items. This pack has seven pockets, many convenient compartments, and straps to give everything you might carry an organized, compact space of it’s own. The Bat Wing design exemplifies this. It’s made up of three horizontal straps that open up to two panels, allowing for further storage, compression, and security. Within the bat wings there are vertical pockets. One pocket is meant to fit a spotting scope and this pocket secures with a button. The other pocket is mesh and there are additional straps to secure something like a tripod. The Rear Entry Suspension is a similarly convenient and easy way to make good use of this pack’s space. If you don’t want to take your pack all the way off to save time or avoid mud or snow, unclasp the sternum strap, release yourself from the shoulder straps, swing the pack around to the front of you and let it hang. The hip belt secures the pack to you while you unzip the panel and gain access to the back and bottom of your pack. On the hip and waist belt there are more pockets meant for easy access to items like snacks and calls. On both sides of the hip belt there is also a pistol holster. Unfortunately, with this pack there’s not a large margin of adjustment in the hips and shoulder to fit a smaller hunter, someone around 5’6” or below. The Blaze Orange Meat Shelf is in the bottom of the pack, there’s a zip- away compartment that rolls out and clips up vertically to the top of the pack to store your meat. There are even cross straps you can use to compress the shelf closer to your back, making the load easier to carry out. A rifle boot also drops down from the bottom of the pack and can be secured with cross straps as well. What is the newest version of this pack? This is the latest version available. What’s the difference between the 2016 and 2017 models? The camo. The Realtree AP-Xtra camo is being discontinued and the Approach camo is the 2017 model. Is there a place to store a bow and a rifle? Yes. The rifle boot comes with the pack but the bow boot would have to be purchased separately. Is the torso length adjustable? Yes, it is but note that for some smaller hunters (<5’6”) there have been pack fit issues. Will Camelbaks or Platypus water bladders fit in this pack? No, they will be the wrong size and length. Badlands sells their own water bladders that will fit. No, but it’s water resistant. Can this be used as a carry-on for air travel? If not filled to bursting, yes. Is Badlands an American Company? Yes, Badlands is based out of Utah. If you purchase this pack through Amazon, does the Badlands lifetime warranty still apply? Yes. Wherever you bought it or even if it’s given as a gift, the warranty covers your pack. This pack has so much to offer you in terms of space, comfort, and adaptability. The fabric patterns and bright orange meat shelf help you to blend in and stand out when you need to. The durable fabric and quiet zippers will add to the ease of your hike or hunt. Staying organized with this pack is a breeze between the compression straps and quick access pockets. Perhaps the best perk of all with this pack is the Badlands lifetime warranty. They’ve really got your back. Can’t wait to stop dreaming about this pack? Don’t! Shop the Badlands 2200 backpack on Amazon here.